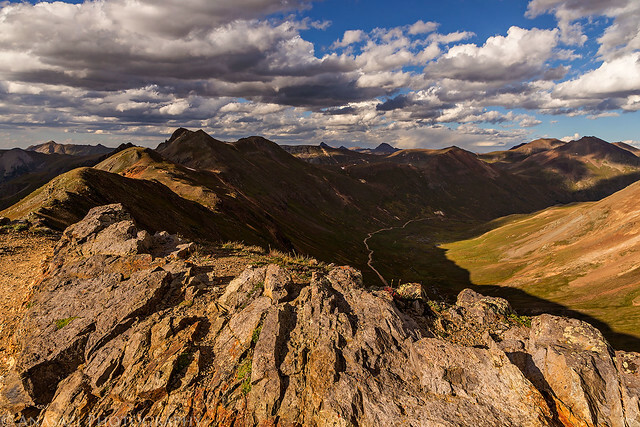 After checking out the views from the Sunnyside Saddle over Eureka Gulch we made our way over Hurricane Pass. 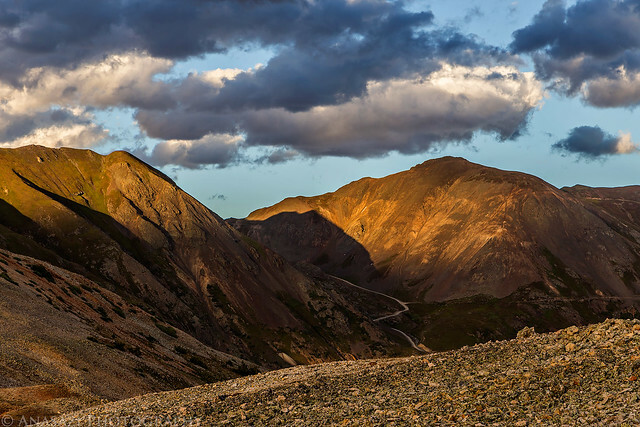 Hurricane Peak (13,447 feet) is straight ahead and lit up by the sun. 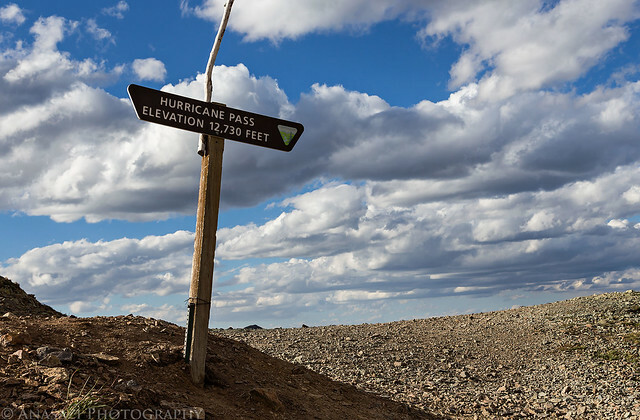 We made a short stop at 12,730 foot Hurricane Pass before continuing on to California Pass. 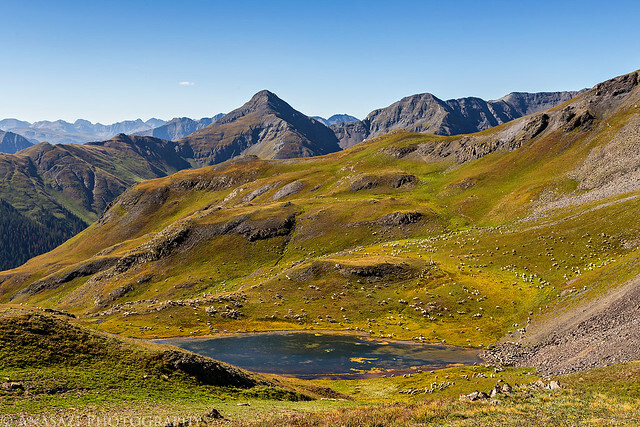 The view over Lake Como and Poughkeepsie Gulch towards Tuttle Mountain (13,203 feet) as we descend from the pass. 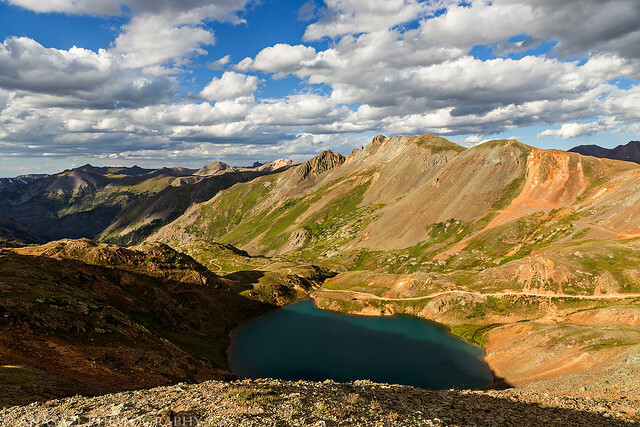 We spent some time at California Pass (12,930 feet) watching the clouds move quickly above creating shadows on the landscape below. 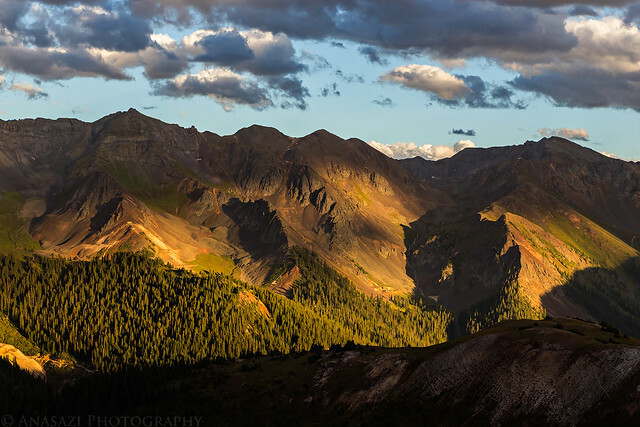 The California Gulch Road is down below and in the distance 14ers Uncompahgre Peak and Wetterhorn Peak are visible in the shadows with Matterhorn Peak between them. I hiked a short distance along the ridge leading to Tuttle Mountain. Here’s another short video made with Hyperlapse showing the movement of the shadows over California Mountain. 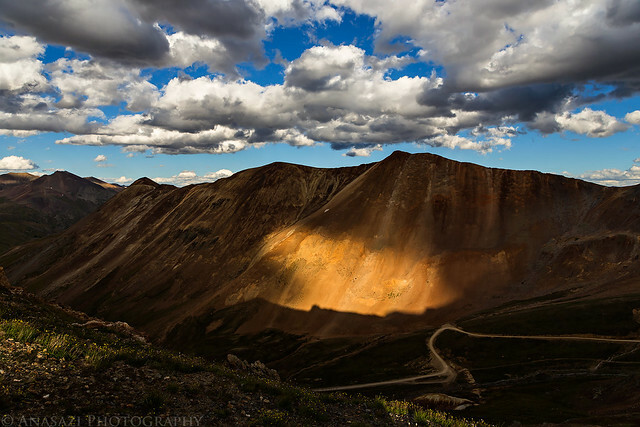 Spotlight on California Mountain (13,220 feet) across the gulch. 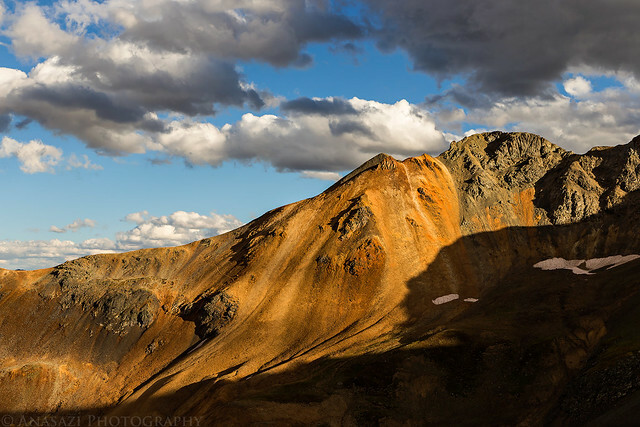 Evening light on Hanson Peak (13,454 feet). 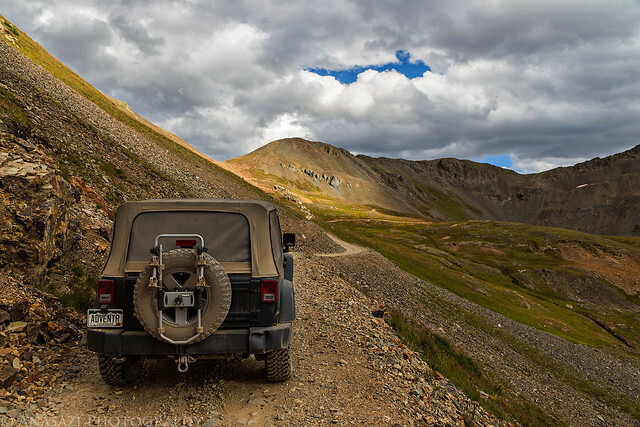 My Jeep parked at California Pass as I hiked back. 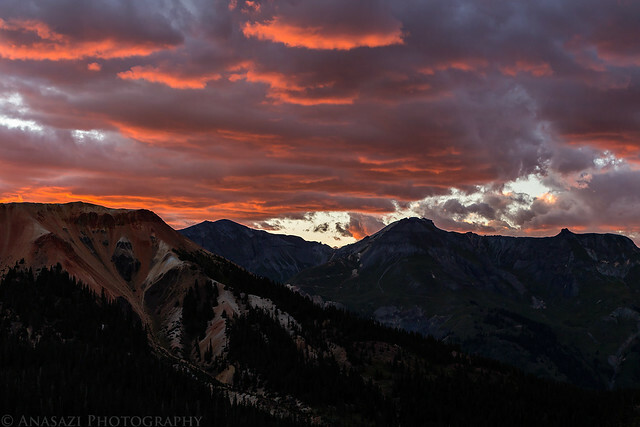 View towards Bonita Peak (13,286 feet) over Ross Basin as we drove over to Corkscrew Pass to catch the sunset. 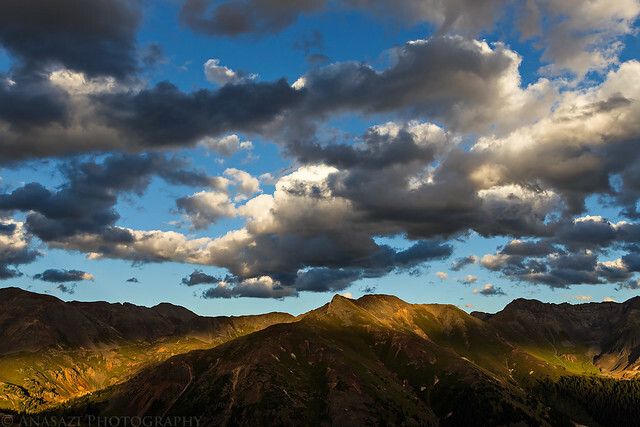 Beautiful evening light and shadows on the surrounding peaks. The clouds were pretty nice this evening. 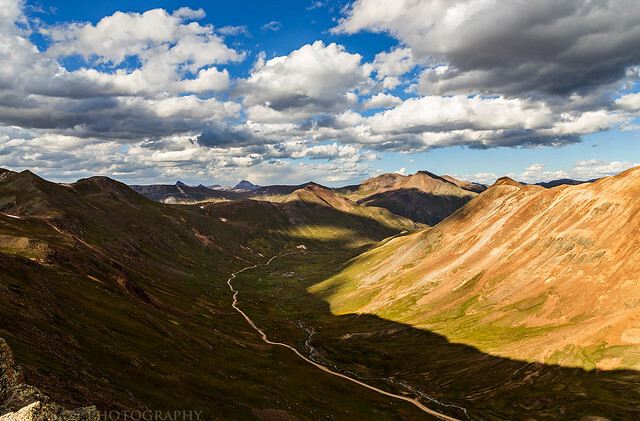 Looking back at the Hurricane Pass Road climbing up between Hurricane Peak and Brown Mountain (13,339 feet). 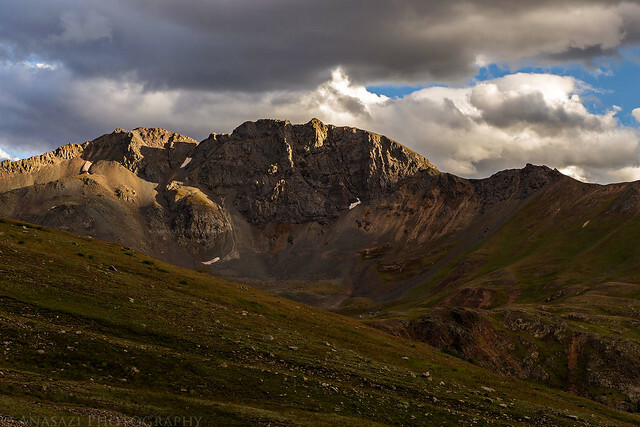 There are a lot of 13ers in this area I need to climb! View across to Minnehaha Basin with Emery Peak (13,310 feet) and Proposal Peak (13,330 feet) above. 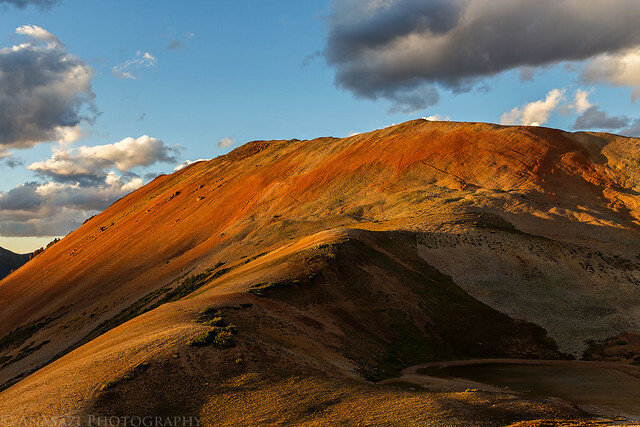 Sunset on Red Mountain #1 (12,592 feet) from Corkscrew Pass (12,400 feet). 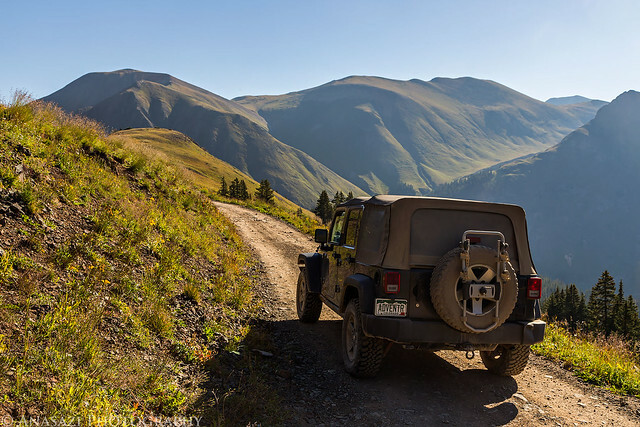 My Jeep near the pass. 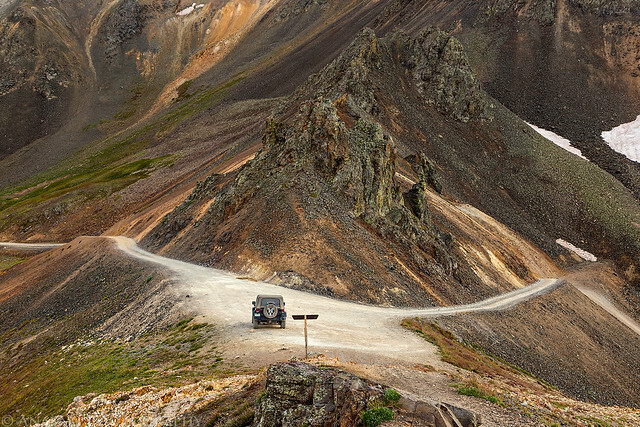 Driving down the switchbacks into Corkscrew Gulch. 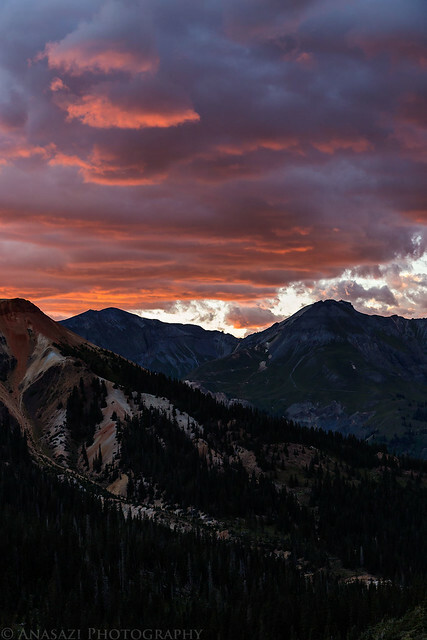 There was a beautiful magenta sky as we descended into Corkscrew Gulch to head back to camp. We decided to sleep in on Monday morning and I’m glad we did. When we looked out of the tent we saw that all of the clouds had disappeared and we were left with nothing but blue skies above. The wind that was around the previous evening had died down overnight but started to pick up again when the sun came back out. 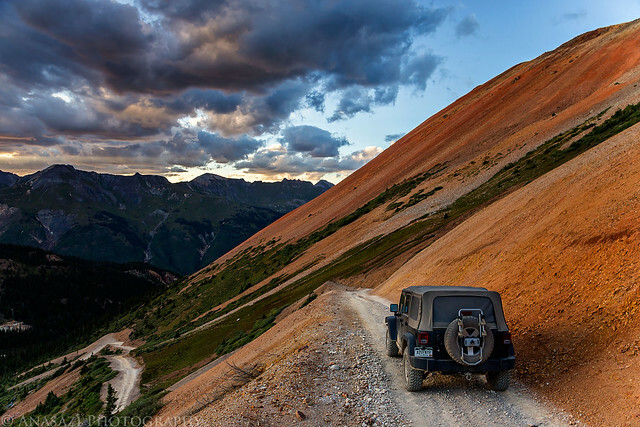 After packing up camp we wanted to drive one more short Jeep road near Silverton known as the Treasure Mountain Loop. 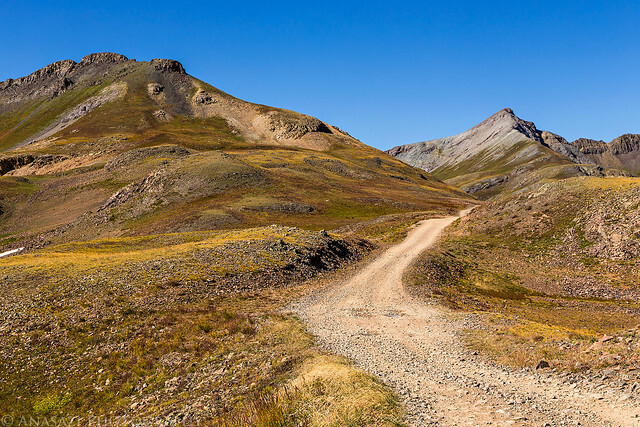 This route starts out by climbing through Picayune Gulch (spelled Picayne on the USGS topo maps) to a ridge of Treasure Mountain and then drops down into Placer Gulch. I had driven this trail way back in 2007 but had not been back since and I wanted to check out the area again since my memory of it was pretty foggy. 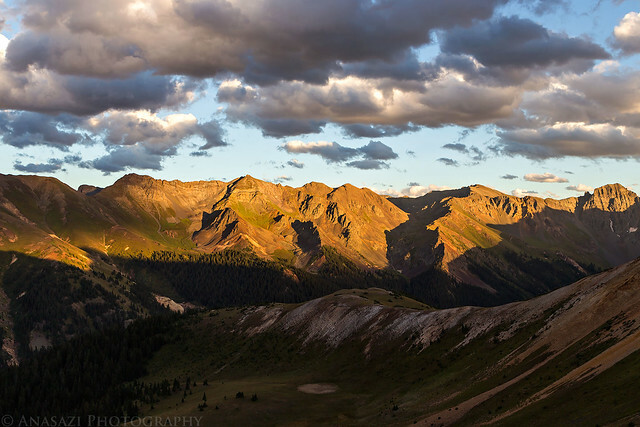 While we were at the top of the ridge between the two gulches I took a short hike to the top of Treasure Mountain (12,900 feet). 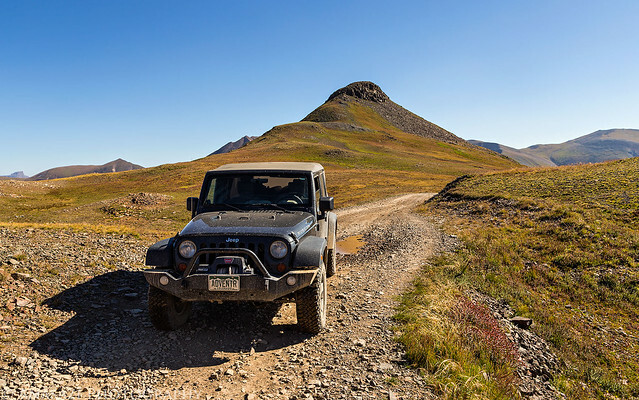 Driving out of Picayune Gulch with Grouse Gulch and the very top of Handies Peak in the distance. 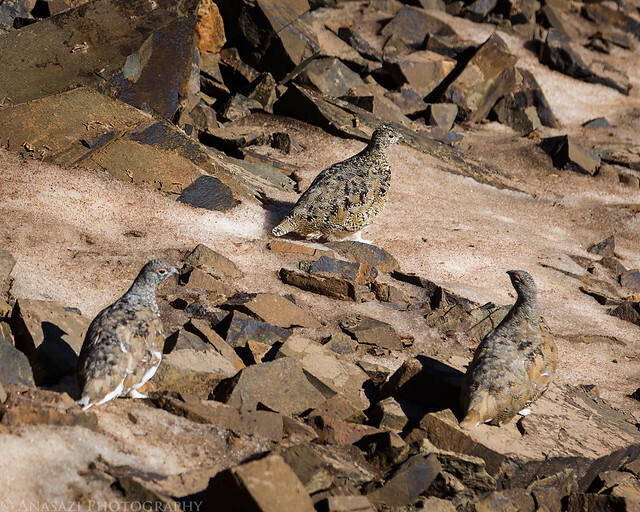 After climbing back down from the summit of Treasure Mountain I spotted four Ptarmigan in the rocks. Only three are pictured here. Had one of them not been standing on the snow, I probably would have missed them completely since the others blended in well with the surrounding rocks. Crossing the ridge between Picayune and Placer Gulches with Hanson Peak straight ahead. 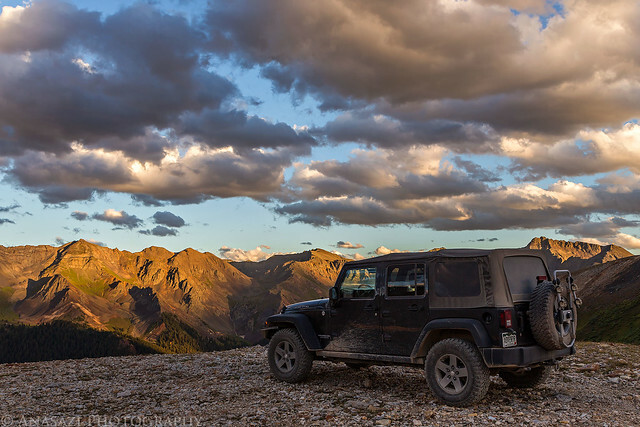 My Jeep with the summit of Treasure Mountain behind it. It was an easy hike from the road up there. Before descending into Placer Gulch we stopped at an overlook of Parson Lake which had a sheep camp setup nearby. Look closely and you’ll notice that those aren’t white rocks scattered about, there are sheep everywhere. 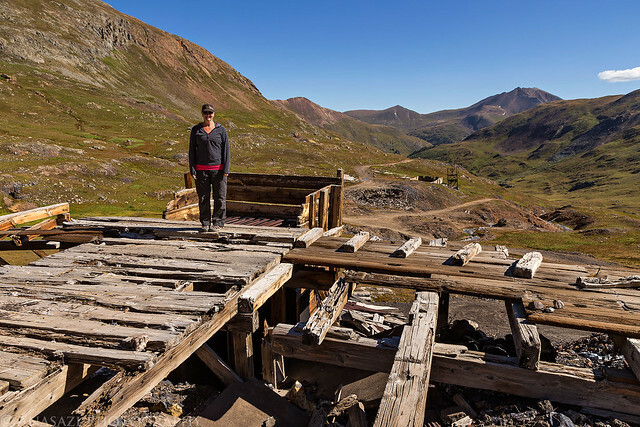 We stopped to check out the remains of the Gold Prince Mine on our way through Placer Gulch. 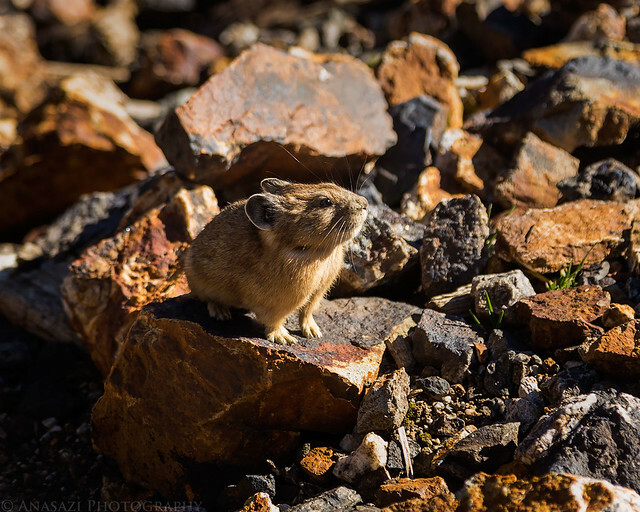 This little pika was scurrying around in the rocks near the old mine. 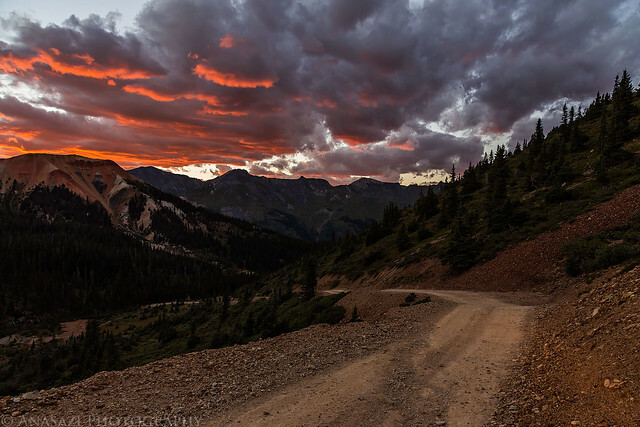 After finishing the loop at the ghost town of Animas Forks we started our drive back home. It was a nice relaxing holiday weekend in the mountains.